Lifetime Products, Inc started out in the early 1970s as a one-man operation that involved founder Barry Mower building basketball standards in his backyard. The company eventually transformed into a sporting goods store, although a continued focus on basketball standards let to the development of an easily adjustable hoop, backboard, and stand system that remains the industry standard to this day. Barry Mower’s backyard basketball hoop business and sporting goods store became Lifetime Products, inc in 1986, and gradually exanded its focus beyond basketball standards and other sporting goods. Today, Lifetime Products manufacturers and sells everything from sheds to tables to utility trailers. Lifetime Products first introduced its line up folding tent trailers in 2008, and today they manufacture some of the smallest, lightest tent trailers out there. Their entire lineup falls into a category that is sometimes referred to as “tent-on-trailers” and they are light enough to be towed by many small SUVs, crossovers, and even passenger cars. 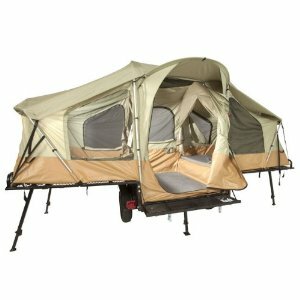 While these ultra-light, super-portable tent trailers don’t provide the same protection from the elements that you get from a rigid pop up camper, they do offer a nice step up (literally) from regular tenting. The other benefit of Lifetime tent trailers is that when they’re fully folded up, they double as utility trailers. You have to be careful not to overload one if you’re towing with a passenger car or crossover, but that added storage space can really make the difference in that same situation. Sahara 10.5' x 6.6' 700 lbs. 1,250 lbs. Great Basin 10.5' x 6.6' 700 lbs. 1,300 lbs. Lifetime 10.5' x 6' 800 lbs. 1,300 lbs.